Los Angeles Memorial Coliseum to United Airlines Memorial Coliseum? Los Angeles Memorial Coliseum to "United Airlines Memorial Coliseum?" Entrance to Los Angeles Memorial Coliseum. Los Angeles Almanac Photo. UPDATE, MARCH 29: United Airlines announced this day that they are willing to withdraw from the renaming deal with USC for the Los Angeles Memorial Coliseum. It was also reported that USC has said that, if United Airlines agrees, they are open to modifying the naming deal to "United Airlines Field At Los Angeles Memorial Coliseum." We applaud both gestures and look forward this being worked out. Sometimes we respond to the past with love and affection and sometimes with respect or even pride. Sometimes we respond with sadness or even cringing. The worst response to the past is indifference. Indifference means that the past made no difference at all and that's typically not a good thing for the present or the future. On January 29, 2018, the University of Southern California announced an agreement with United Airlines, Inc., to rename Los Angeles Memorial Coliseum to “United Airlines Memorial Coliseum.” In return, USC receives $69 million towards a $270 million upgrade of the 96-year-old stadium. The new name is set to become official in August 2019. The Los Angeles Memorial Coliseum was commissioned in 1921 to become a living memorial to Los Angeles veterans of World War I. In 1968, it was rededicated to honor all American veterans of World War I. Since opening in 1923, the Coliseum hosted two Olympiads (and a third scheduled for 2028), two Super Bowls and one World Series. It is the only venue in the world to host more than one Olympiad. It hosted John F. Kennedy's speech accepting his party’s nomination for President of the United States during the 1960 Democratic National Convention in Los Angeles. John F. Kennedy's acceptance speech at L.A. Memorial Coliseum. Photo by San Jose Mercury News, courtesy Wikimedia Commons. It hosted the first NFL-AFL Championship Game that would become the Super Bowl. It hosted a Billy Graham crusade that drew 134,254 people, its largest attendance ever. It hosted the first match for the U.S. men’s national soccer team. It has been home to the USC Trojans, UCLA Bruins, LA Rams, LA Dons, LA Dodgers, LA Chargers, LA Wolves, LA Aztecs, LA Express, LA Raiders, LA Xtreme and LA Temptations. Postcard showing Los Angeles Memorial Coliseum, 1940. Published by Western Publishing & Novelty Co, Los Angeles, Calif.
USC’s decision to discard the original name of one of our historic icons – an icon meant to honor veterans and one deeply ingrained in our story as a city and county – demonstrates gross indifference to our past. Of all Los Angeles institutions, USC should know better. The university itself is one of our historic icons and rightfully takes great pride in its own place in our past. We acknowledge the huge challenge to fund the Coliseum’s restoration, but we cannot accept indifference towards the Coliseum’s story and place in our history. We are not the City and County of United Airlines. We join Los Angeles County Supervisor Janice Hahn and Los Angeles area veterans in calling upon USC President Carol L. Folt to reconsider this decision. If you would also like to join a petition to USC President Folt to reconsider, find the petition here. Also see “Don’t change the name of Los Angeles Memorial Coliseum,” written by Los Angeles Supervisor Janice Hahn, published in the Los Angeles Times. 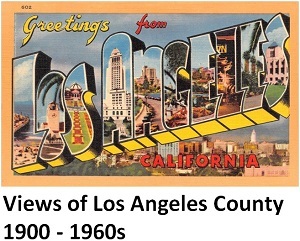 Published by Longshaw Card Co, Los Angeles, Calif. From the Los Angeles Almanac Postcard Collection.